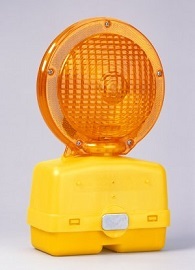 Model 400 Barricade Lamp with LED Flashing Light and Audible Beep for added safety and a warning to blind pedestrians. Operates on two 6-volt batteries (not included). Flash/Beep or Off functions. High-impact polypropylene - UV stabilized with Yellow case. Standard flash rate is 65 +/- 10 Flashes Per Minute.